A bus carrying 41 Vietnamese Thais and Laotians skidded and overturned in Packsan town in Laos’ central province of Bolykhamsay on Wednesday morning, injuring 14 people. The accident occurred when the bus was trying to avoid a vehicle going in the opposite direction. Both drivers were contending with bad weather conditions. The injured were rushed to the general hospital of Bolykhamsay province. Two of them are in serious condition. The bus was one of three carrying 123 Vietnamese Thais and Laotians and their relatives back to Việt Nam after a trip to several relic sites in Thailand dedicated to late President Hồ Chí Minh. The May 17-23 trip was organised by the Việt Nam-Thailand Friendship Association to mark the 128th birthday of the late Vietnamese leader (May 19). 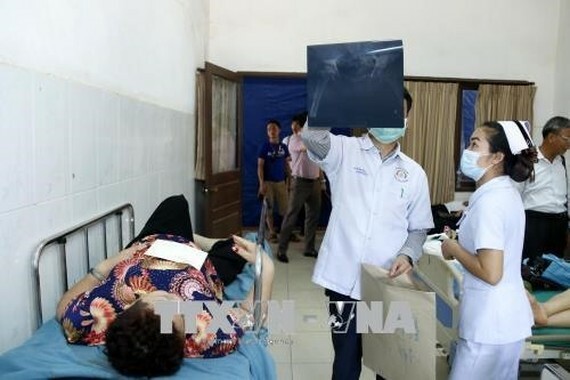 After learning about the accident, representatives of the Vietnamese Consulate General in central Laos came to the hospital to visit the victims and help them complete procedures to move to the general hospital in Vinh city in Việt Nam’s central province of Nghệ An.